Sorry to fake you out. Its not me, My middle name is Sheree not something that starts with an A. I actually have never been arrested. I do have a speeding ticket from a few years ago. What can I say I like to drive fast. My girls discovered Mugshots.com and have had way too much fun looking for names of people they know. I admit I have enjoyed it too. I was surprised to see someone with my name. Grass isn't a super common last name. I didn't think anything could be worse than drivers license pictures but mug shots beat them hands down. I have killed more time than I care to admit laughing at the pictures posted. I've never been arrested either. I was only pulled over once for speeding. Speeding is a problem for me. I am just too impatient. That is an awesome website. I'm going to have to check it out! I have had way to much fun looking people up. I've been surprised a few times with mugshots of people I knew. Ok, whoa. Major fake out! Lol - I was all scandalized and excited to read your arrest story. :P Ryan and I both have super common names, so there's not point in ever trying to look ourselves up. There'll be hundreds of results. haha Sorry to bore you with my goody goody lifestyle :) I kinda feel sorry for the other Holly Grass. 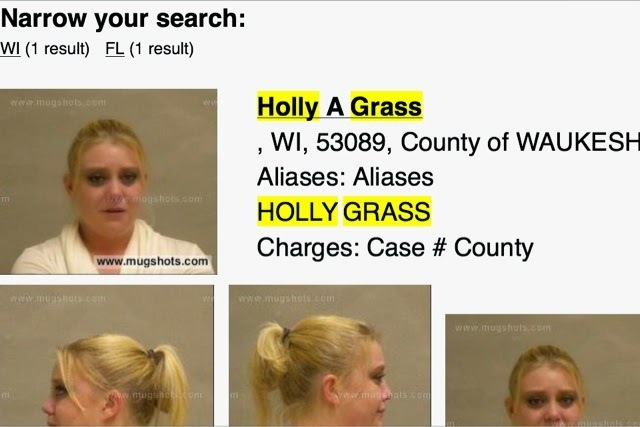 The life of Crime has not been kind to her looks.